Email has come a long way in the past couple decades, but it’s still a hassle to send large files as attachments. Some email accounts have attachment-size limits, either for the sender or the recipient; many people check email on mobile devices, where large attachments can be both difficult to manage and expensive to download; and many people simply think that large attachments are bad email etiquette. For all these reasons, cloud-based file-sending services have become quite popular. Instead of attaching a large file to an email message, you upload the file to cloud storage (a service that stores your data on a server that you connect to over the Internet). The service then provides you with a URL for downloading the file, and you include that URL in your message. The recipient receives an email unencumbered by an attachment, but with a link to download the file if and when they want. The number of such services is surprisingly large and, it seems, growing daily, so obviously there’s a big demand for this functionality. And it’s an approach that works pretty well. However, it’s far from seamless, requiring several more steps than simply dragging a file into an email message—just getting your uploaded file’s public URL can be a hassle. And if you want to send multiple files, many services require that you either compress them into a single archive or perform the above procedure once for each file. You can get around some of the hassle using any of a number of cloud-upload utilities. My current favorite is Swing for App.net, which displays a little “drop zone” icon in my menu bar. When I want to share a big file, I just drag it to the Swing icon; the file is uploaded to my App.net storage, and the download URL for that file is automatically added to the clipboard for pasting elsewhere. If I drag multiple files to the icon, Swing will even combine them in a single .zip archive for me, and then upload just that archive file. But even Swing requires you to complete a separate task that interrupts the normal email workflow. Which is why CargoLifter will be so appealing for people who don’t want to have to deal with adding Yet Another Process to their daily grind. This nifty add-on works with Mail to give you the benefits of cloud storage of attachments without the hassle. CargoLifter can prompt you to upload large attachments. With that out of the way, whenever you want to send a large file, you just drag it into a new email message in Mail, as you normally would. When you send the message, CargoLifter by default displays an alert box asking if you want to upload the attachment(s) or send them normally. Click Upload Attachments, and CargoLifter automatically uploads the file(s) to your cloud-storage service, displaying a progress box during the upload. When the upload is finished, CargoLifter removes the attachment(s) from the message and replaces them with the appropriate download URL(s). It also appends some basic text explaining to the recipient that your attachment(s) are available online; the text includes the download name(s), the total size of each download, and the URL(s). You can then send the message. If you want to make this process even more seamless, you can disable the attachment prompt (so that CargoLifter automatically uploads attachments without asking) and enable automatic sending (so that CargoLifter immediately sends your message after uploading your file[s] and including the resulting URL[s]). With this set of options, Mail functions exactly like it always has…except that you’re not burdening your messages with attachments. You can tweak CargoLifter’s behavior so that it uploads (or prompts you to upload) only if the size of any single attachment, or of all attachments together, is greater than a certain amount. You can also have CargoLifter automatically compress files, and combine multiple files into a single archive. And if you don’t like CargoLifter’s default download-info text, you can provide your own. If your cloud-storage space is limited, you’ll want to periodically go through whatever directory CargoLifter uses to store files (for Dropbox, for example, it’s /Apps/CargoLifter) and remove any older attachments that you’re confident your recipients have already downloaded. I’d like to see CargoLifter include a feature to automatically delete attachments after, say, 30 days. I’d also like the option to have CargoLifter use a custom URL-shortening service. If you send large files only occasionally, CargoLifter probably isn’t for you. But if you regularly include attachments—and especially large ones—in your email messages, CargoLifter can streamline your workflow to the point where you’ll soon forget it’s not a feature included in Mail. 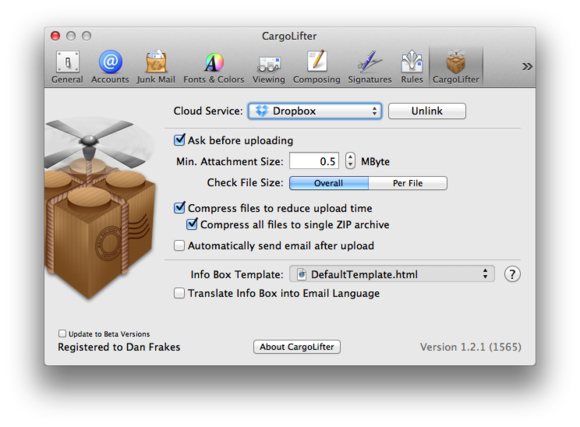 CargoLifter slims down your email messages by automatically uploading attachments to your favorite cloud-storage service.